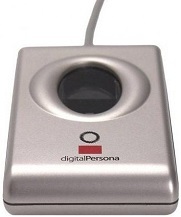 The U.ARE.U 4000B Reader is a USB fingerprint reader, the user simply places his or her finger on the glowing reader window, and the reader quickly and automatically scans the fingerprint. On-board electronics calibrate the reader and encrypt the scanned data before sending it over the USB interface. The U.ARE.U 4000B utilizes optical fingerprint scanning technology for superior quality and product reliability. The U.are.U 4000 is a USB 2.0 fingerprint scanner that is able to scan dry, moist or rough fingerprints. Also it can reject latent or spoof fingerprints.